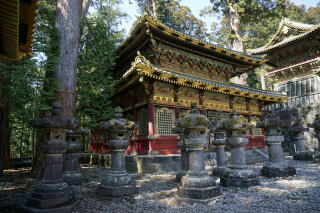 Almost all the shrine complexes we see were rebuilt in 1636, twenty years after Tokugawa Ieyasu’s enshrinement. 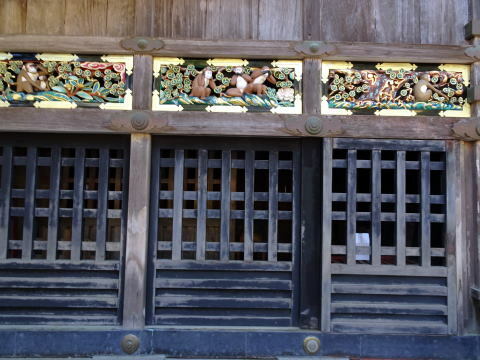 and the actual construction and carpentry work was the responsibility of master carpenter Kora-Bungo Munehiro. 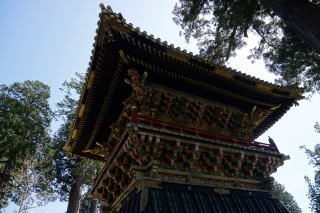 of the site, allowing the arrangement of the shrine buildings in a pleasing balance to create a solemn, religious atmosphere. 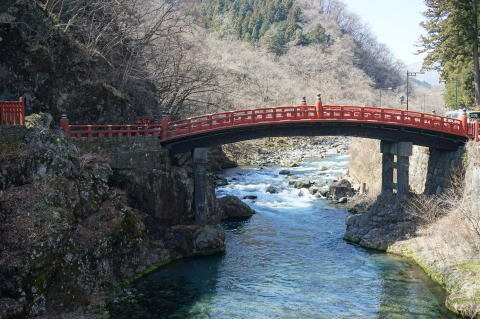 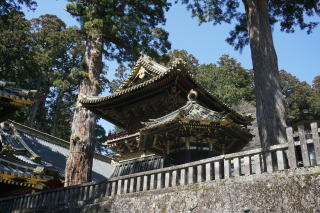 structure is known as one of the three most beautiful bridges in Japan and is a perfect gateway for Nikko. 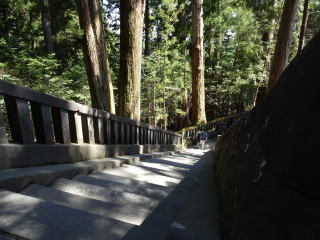 wide, and stands 10.6 meters above the Daiya River. 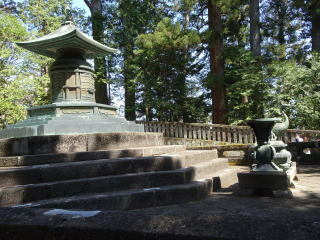 rebuilt in 1818 by Sakai Tadayuki, a lord of the same lineage. 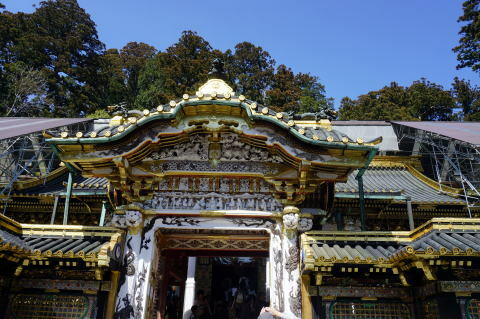 Omotemon (Front Gate ) : Omotemon Gate is the first gate at Toshogu Shrine, as designated an Important Cultural Property. 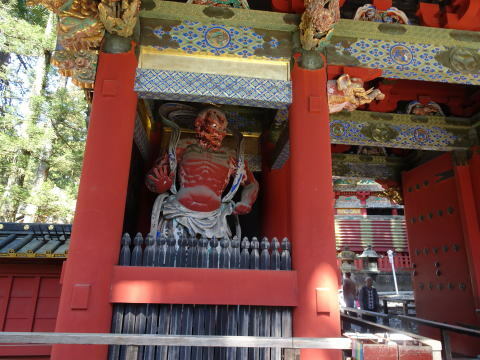 It is also called Nio Gate because of the two guardian deity statues positioned in the left and right. 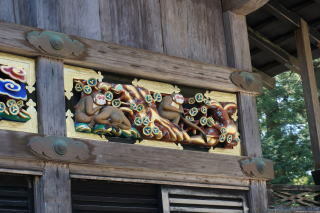 There is a frieze of eight panels of carvings of monkeys running through the building, depicting the lives of ordinary people. 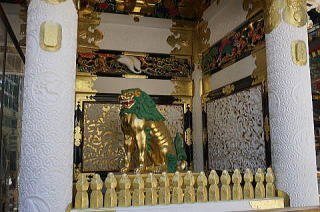 Monkeys have been regarded as guardians of horses since ancient times. 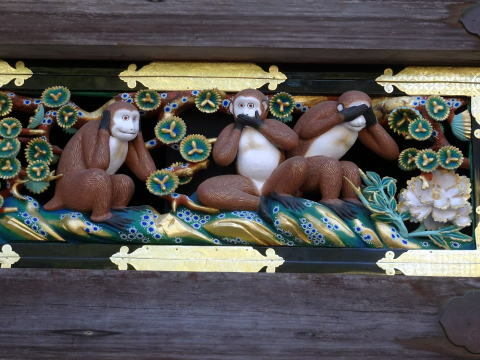 Carving of three monkeys, 'See No Evil, Speak No Evil, Hear No Evil', is particularly famous. 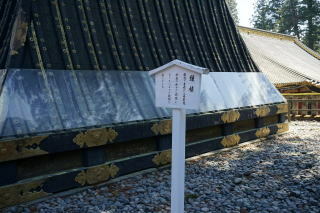 the Imperial Court'. 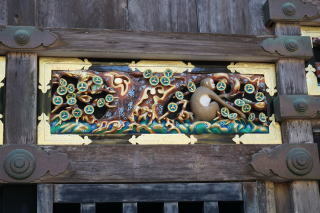 It is also called 'Gate of the Setting Sun', because one could gaze upon it all day and never tire. 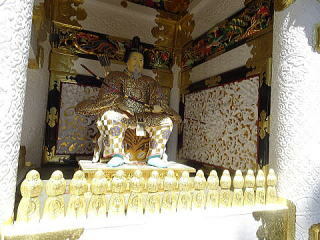 It is covered with over 500 carvings depicting traditional anecdotes, children playing, sages and wise men. 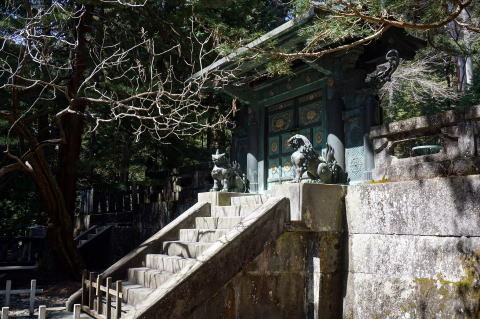 A dozing while surrounded by peonies and bathed in sunlight by the master caver, Hidari Jungoro. 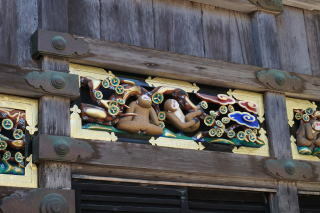 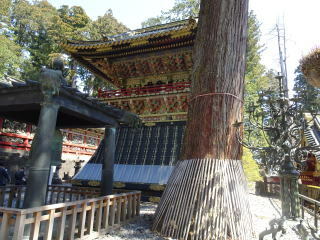 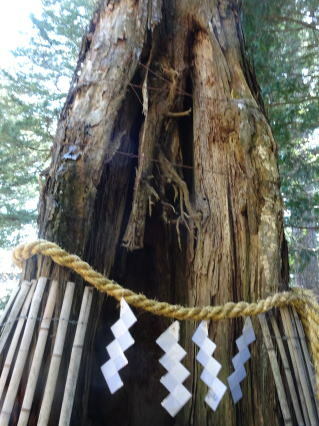 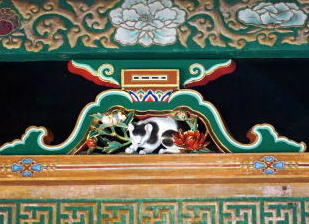 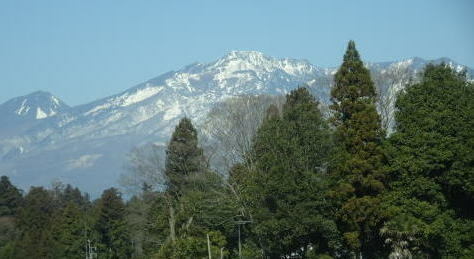 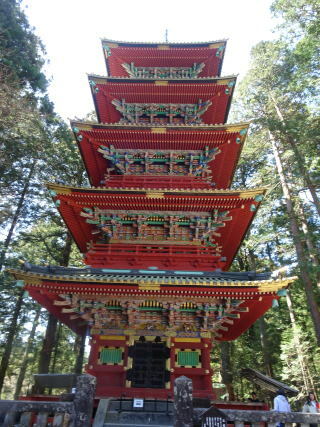 As designated a National Treasure, this carving of is also said to be a depiction of Nikko (Nikko means the sunlight). 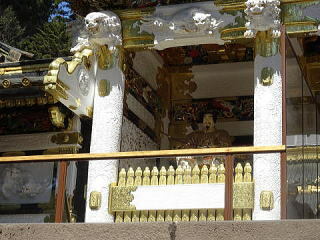 (legendary Chinese sages), an audience with the emperor, and other scenes. 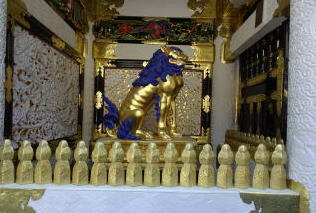 The Main Shrine consists of the Honden (Main Hall), Ishinoma (Stone Chamber), and Haiden (Worship Hall). 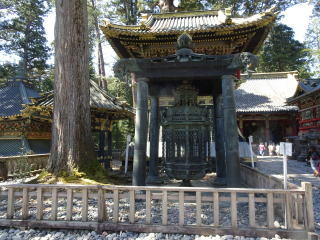 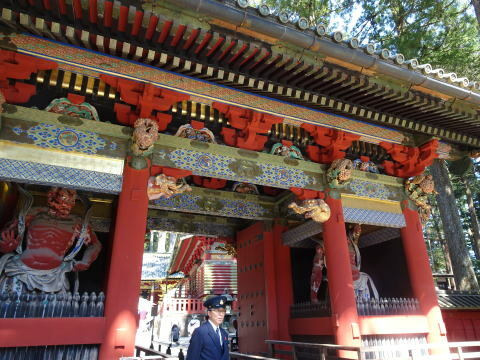 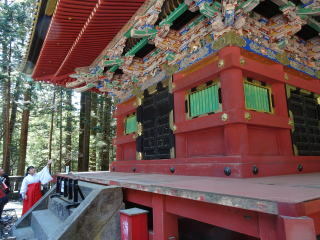 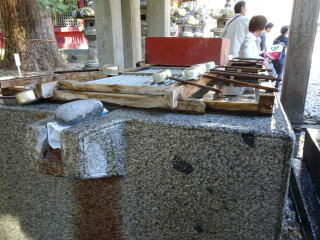 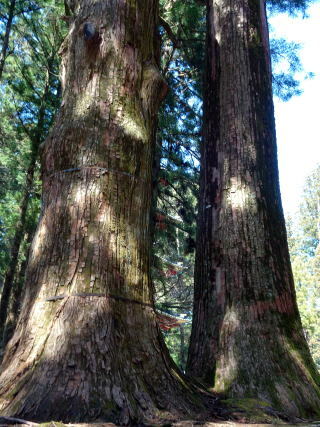 It is the most important area at Toshogu Shrine. 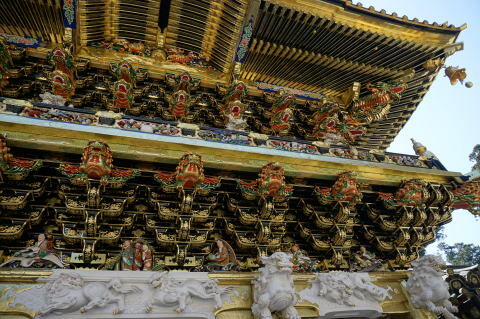 Annual festivals and events are conducted here. 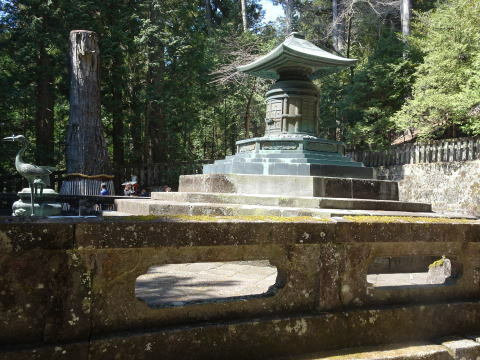 The copper treasure tower of Okusha is the tomb of Ieyasu Tokugawa, and it seems that the remains are buried under. 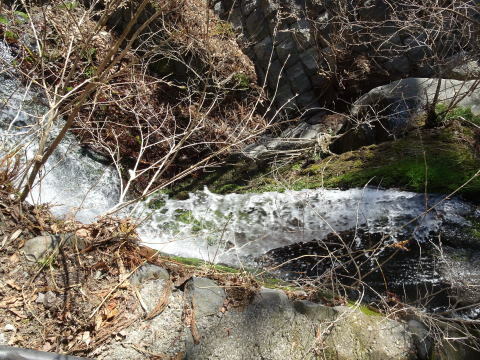 In spring time, the amount of water increased because of snow-melting water. 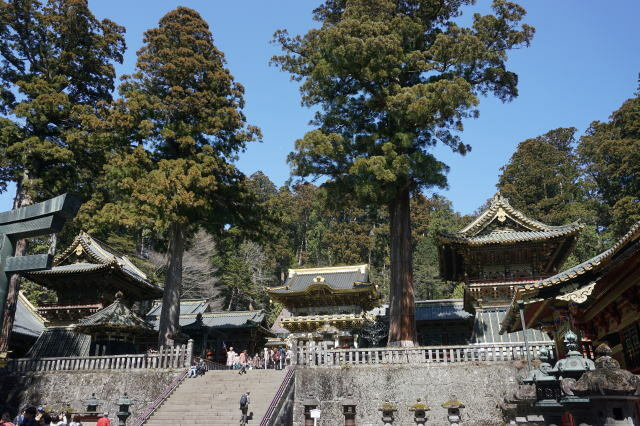 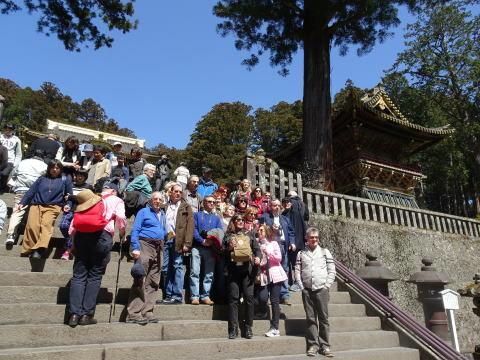 The historic sites of Nikko are about 120 km north of central Tokyo, and getting there by train is easiest. 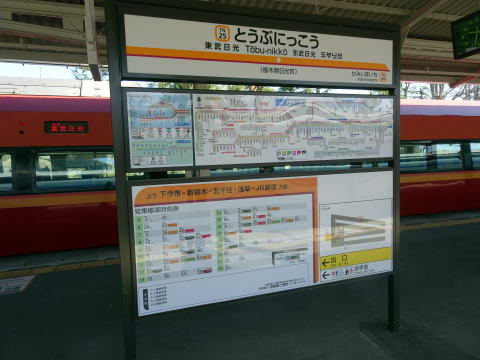 There are two train stations at Nikko: Tobu Nikko and JR Nikko. 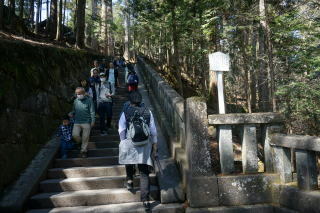 is the quickest and the most popular. 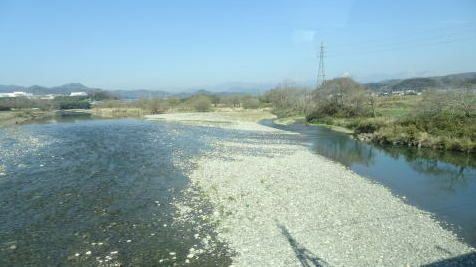 Tobu railway line at Kurihashi station, and the railroad track branches off to the kinugawa line at Shimoimaichi station. 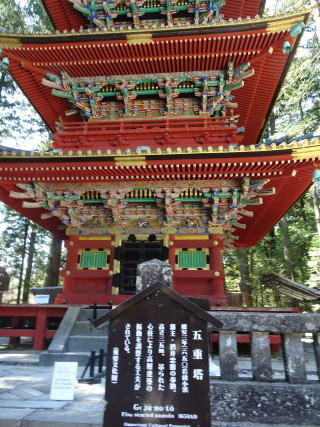 running to Nikko. 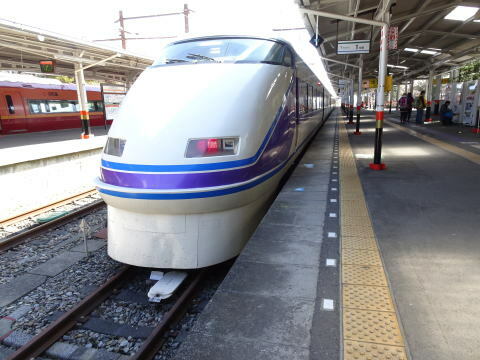 The journey takes around 2 hours and 40 minutes. 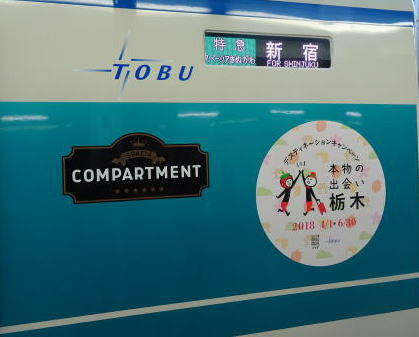 There is another route to and from Ueno or Tokyo station to Utsunomiya, using Ueno-Tokyo line. 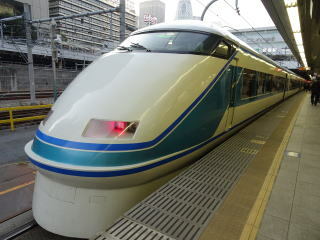 (L) An express train Nikko #1 is to leave Shinjuku station. 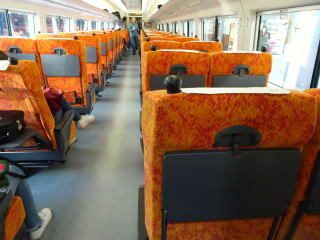 (R) Intrior of the Nikko #1 train. 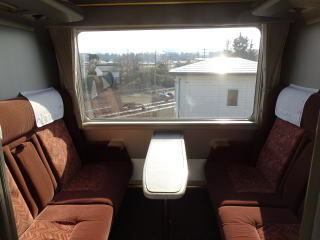 All seats are reserved. 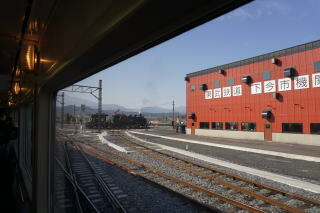 (L) A train is passing the bridge over Tone River. 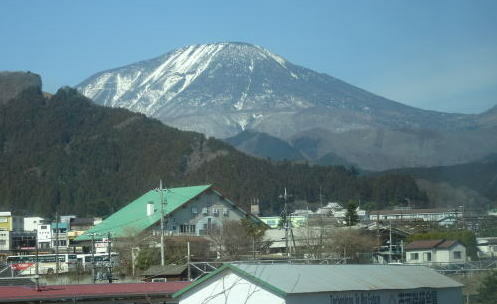 (L) As the train is approaching, we can see Nantaisan Mountain ( Alt, 2,486M ) through the train window. 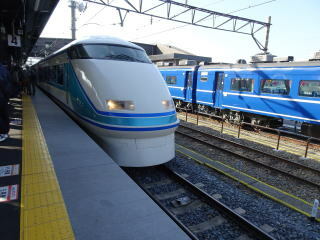 (L) A train is just arrived at Tobu-Nikko station. 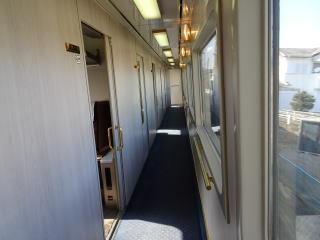 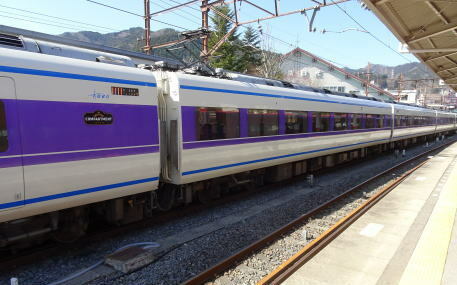 (R) The exterior of Mikko Tobu Specia express train ready to start from Tobu-Nikko station. 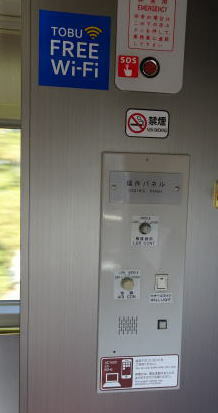 (L) Air-conditioning-system panel is provided at the private room. 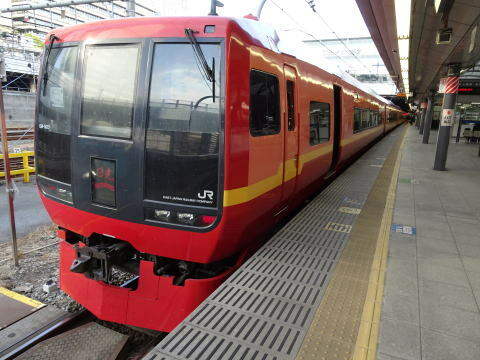 (M) Specia-express train arrived at JR Shinjuku station. 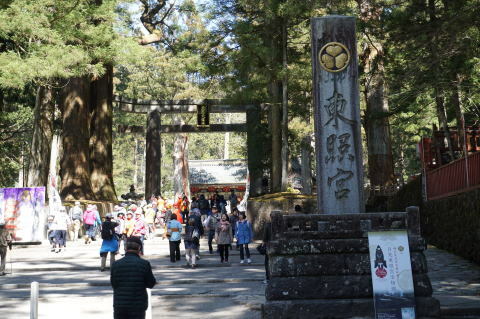 The article was written in March 2018. 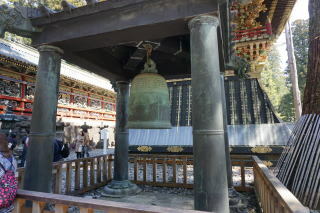 All photography was taken by Dr. Junhaku Miyamoto in March 2018.